I was consulting to a development manager at a tech company. He told me that the CEO, his boss, wouldn’t give him the salary and option freedom he needed to close a great programmer he’d found. Salary would have been 20% above what he had approval to offer; and, thanks to the new accounting standards for stock options, he didn’t have the authority to offer options. He lost the potential new hire and had to settle for someone merely “good”. Ironic thing is that he had several open positions so, once he gets through hiring several people, he’ll end up paying more in the aggregate than he would have paid for the superstar – and probably won’t get as much productivity. Why do we persist in evaluating productivity as if the only model for productivity is the assembly line? Creative work is anything but incremental--it's in fact inherently exponential. If Einstein could accomplish a civilization's worth of "work" in a single calendar year (1905, while he was "working," incidentally, as a patent examiner), why don't we recognize that it's more efficient to value productivity on the content of the contribution alone? Curiously, the only "jobs" now valued in this way are top-level executive positions, where the results are indeed measurable in company earnings, and where all measurements indicate that an investment in higher salaries has no positive effect. Shouldn't it be the other way around? Let executives "earn" their salaries in the form of a profit share, but make capital investments in talent. Mayfield suggests he'll be looking at prospective hires' "extracurricular" activities, like World of Warcraft play, as well as their work achievements from now on. I say, if we can learn to do business better by playing games, couldn't we also improve business itself by making business itself more like a game? As a manager, I'd love to have lots of Avatars. I'd also like to see Avatars in a company perform specific jobs, especially those jobs no "real" person likes to feel stuck--anyone in the company could become Vlad the Collector for the length of a phone call, or spend an hour playing Katrina the Customer Service Fairy with far less ego-involvement than they feel being dispatched to do these things now. Role-playing could make the "dirty jobs" of business more palatable (and keep egos in check for the big jobs, too). I also like the way games quantify abstract acheivements and encourage non-monetary forms of exchange between players. Getting people within a company to collaborate has always been an issue. What if they had karma, health or power points in a game, some juju to trade? You could look at this as encouraging "office politics," but if you've worked in an office, you know the vast amounts of energy that go into office politics no matter what you do. Why not harness and store that energy and put it to use? Could we make work as engaging and dynamic and fun as a game? Of course we could. I'd like to someday build an entire company with a virtual office on a gaming platform, and hire from the ranks of online players. Kind of like Ender's Game, but with profits instead of destruction. "People who have learned to answer email on Sunday evenings also need to learn how to go to the movies on Monday afternoons. By redesigning the architecture of time, we can make room for work, leisure, and idleness." I'd add that, unless you still work in a shirtwaist factory, there shouldn't be any real need to continue to differentiate strictly between work and leisure. My leisure activity of choice (sailing) is more work than my work (writing). And neither one is more fun than the other. To further muddle the distinction, sometimes going to the movies or watching TV becomes work for me, if I end up writing that part of the reason people love to watch so much Law & Order (aside from an understandable jones for law and order) is that the show is about people who live their work entirely holistically. It is probably a good thing that FOSS strategies and tactics are being used in Africa to move things in whatever direction they're gonna go in -- without the additional (colonial?) burden of rights-bound software. But in the face of limited resources on the planet and even fewer resouces in the majority of African countries, will computing be to Africa be as "important" as it is in the North? Will it take the same shape as we in the US expect? Flash-animated websites, adservers, news feeds for one class of user, proprietary networks for another class of user, etc. Are woman-centered FOSS efforts going to work differently than capitalist and anti-capitalist (male) ones? It seems to me that successful computing in Africa is going to have to follow a low-power, distributed model. Everyone who has computing capacity is going to have to share it with everyone else... like the SETI project, in a future Africa, idle cycles from all manner of computing devices (cell phones, PDAs, desktop machines, workstations) are going to have to support the information infratstructure of a future Africa. Or will Africans simply centralize their computing power in resource-intensive, air conditioned, highly-secured physical locations? If Cheik Diop was right about Meridional Civilization vs. Northern Civilization, then in the same way that the regular flood of the Nile "programmed" humans to work collectively (ultimately making examples of both monumental architecture and long-term peace possible), Digital Africans would benefit from seeking similar approaches to computing resources. For Diop, what was learned in Egypt thousands of years ago still operates in contemporary Black African cultures. At the time he probably would have classified computing power as a natural resource or a scientific field... this is long before it became a lifestyle. To me, FOSS strategies & tactics, in relation to Africa, could work much more like music. Computing is indeed a natural resource--we talk of "data mining" but what computing really accomplishes is mind mining--in evolutionary terms, it's the way we can make our brilliance as valuable as once was our physical labor. No place is better situated to make that leap, I think, than Africa (I write this from Southern California). One point I'd make is that Open Source isn't anti-profit, it's merely anti-capital--in an open source environment, you don't have to amass before you can produce. You can have an idea, write it, and take it to market. There are still barriers, to be sure, but they're fewer than ever, historically. An African woman has as much access as a white man in Palo Alto--other than being outside of the insidery tech community. What she has to weigh against that is a lack of preconceived notions and blissful ignorance of the accepted wisdom in her community--both of which are key ingredients in innovation. I'd urge you to take a "capitalist" approach in terms of monetizing your efforts--make products, start companies, sell stuff, think entrepreneurially. Entrepreneurialism is the noble cousin of capitalism. The next Steve Jobs may well be an African woman--or women. I think it's very, very likely that this will happen eventually, and that the greatness of a continent will come about as a result of the innovativeness of a true outsider tech culture much like the underground culture that drove Silicon Valley in its heyday. As for the idea that strategies and tactics could work more like music: that's the most beautiful and powerful idea I've heard in a long, long time, for so many reasons. Music is both deeply structured and intuitive, and that's what computing is--and the business structure that houses it must be exactly that in order to thrive. 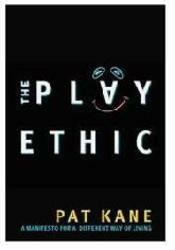 Pat Kane’s book is every bit a manifesto, railing against the Protestant work ethic and New Labour’s ‘getting people back to work’ thinking, and suggesting a new ethic to cope with an unpredictable world. It is an eclectic collection of ideas and discussion, drawing from ancient and modern philosophy, art, music, education and probably every possible discipline you can think of. (The endnotes and references run to some 79 pages – this is a seriously researched text). But far from being a deep academic treatise, it is highly readable; a book that you can skim for ideas, read in depth or skip to the topic that interests. This is not an anti-work book as some commentators have suggested, linking it to Tom Hodgkinson's How to Be Idle or Carl Honore's In Praise of Slow; it is not about promoting laziness or slothfulness, it is about challenging some the values and assumptions that exist in our education, politics and society. If that doesn't make you want to read the book, then you have the soul of a sea cucumber. You can order the British paperback at Powell's (still the best bookstore in the world, despite my recent scolding), or cue up for the forthcoming US edition on Amazon. I've written previously about how hard it is for professional thinkers to shake off the preconception that all "work" involves laboring for a fixed number of hours a day and having the "discipline" to conform to a routine. This post illustrates perfectly how the process of thinking really works, and by inference, how if we fail to allow enough "air" into our days for random chance, we will most certainly miss out on all of the myriad opportunities for inspiration, serendipity and synthesis that life affords. Discipline can be interpreted to mean mastery and achievement--it doesn't have to mean blindering and whipping ourselves on and on and on. The moral being: send a truly, deeply disciplined mind out for a sandwich, and you may get back a masterpiece. NB: There's another message in Rodriguez's post, too, which is to remember not only the humanity and vitality of the worker, but also of the work itself. Whatever we do for a living, be we cannibals, cardinals or kings, it all comes down to creating and constructing the quality of the experience of eating a sandwich.